One of the practical strengths of the lessons is the repeated presentation of different move-order possibilities to enter the base Stonewall formation (Black pawns on f5/e6/d6/c6, with Nf6 and Bd6 piece developments). This allows you to strategize and choose which ones may be best suited for your existing repertoire - including the French move-order (1...e6), Queen's Gambit Declined (1...d5 followed by ...e6), Slav and others. Naturally you can also commit on move one to the Dutch Defense (1...f5), but be careful with that; all of the anti-Dutch lines (like 2. Bg5 and so on) are in play after that, so you may never reach the Stonewall. GM Perelshteyn typically mentions multiple, equally good plans for Black at critical points, although he will indicate a preference and then go deeper into certain lines. For example, the primary strategic option he presents is fianchettoing Black's light-square bishop (with ...b6 and ...Bb7) in the main lines, but there are also examples where the alternate plan of ...Bd7-e8-h5 is shown to be strong. The lessons also emphasize the fact that in the Stonewall, understanding the keys to the different setups / development schemes are usually more important than the move-order. This reduces the amount of memorization required in terms of sequencing moves, and is a helpful insight in general for the improving player. For study purposes, however, it may actually be a little more difficult to integrate the Stonewall into your existing computer repertoire database. I ended up splitting my Dutch Stonewall "games" into two: White fianchetto and White non-fianchetto setups and using more text comments than usual on the ideas involved. Following is a summary of the chapter contents with some personal commentary. Nh3 development by White (instead of Nf3): GM Perelshteyn does a good job of highlighting possible Black plans and offers a suggested method of taking on White's main ideas: Black should preserve the dark-square bishop, exchange off White's bishop once it lands on f4 by ...Nh5, or - in the case of b3 followed by Ba3 - exchange on a3 and misplace White's knight. I appreciated the expert evaluations and explanations of why particular exchanges and moves worked in this particular setup. Normally Black tries to avoid exchanging off the dark-square bishop, for example, but here specific positional considerations outweigh that general principle when White plays Ba3. In the other scenario, Black drops back the bishop on d6 to e7 when challenged by Bf4, since the exchange on f4 would in contrast help reposition White's Nh3 to a better square. GM Perelshteyn prefers the ...b6/Bb7 development in the main line for White that features the development setup b3/Bb2/Qc1/Ba3. He points out simplifying lines leading to endgame and more complex middlegame possibilities. Also shows alternate bishop development in Nc3/Qc2 plan for White, with queenside pawn expansion (Rb1 followed by b4). 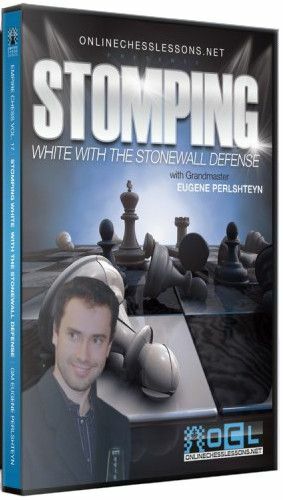 This chapter demonstrates more classic Stonewall kingside attack ideas, centered around an early ...Ne4 by Black, followed by ...Qf6 and ...g5. In this setup, White reserves the option of f2-f3 to kick a ...Ne4. White also has different castling options - Bd2 followed by O-O-O is a possibility. GM Perelshteyn recommends quick action by Black on the queenside after castling (O-O), with ...Na6 development, exchanging pawns on c4 then following up with ...b5. These lines may involve pawn sacrifices, but Black has good compensation. This game is particularly interesting for reaching the Stonewall via the Queen's Indian Defense move-order. Black undertakes a thematic attack on the kingside after playing in the center; Anand switched to this strategy after Kramnik committed to a queenside advance. Below is the (unannotated) game, for those interested in taking a look. This game, by one of GM Perelshteyn's students, features an early c5 by White, followed by immediate queenside play. Black responds with the classic ...Bd7-e8-h5 plan and builds up on the kingside after locking the queenside and center. It illustrates typical Black attacking themes against a setup that might be used by a club-level opponent. One of the important lessons is that Black takes the necessary time to build up and does not rush the attack. Summarizes the overarching ideas: Stonewall pawn formation achieved through various openings - Dutch, Slav, QGD, Triangle formation, French 1...e6; there are various move-order tricks; Black's fianchetto development vs. Bd7-e8-h5 standard plans.